So, its not exactly a horse movie, but if you love rodeo you will love this movie!!! It's based on the story of Lane Frost, a famous bull rider. if you think that the prods and tail twisting makes them mean, go in a pen with them and see how it goes. I'm sure you could walk right up and pet them. I agree, pretty sure you've never been behind the chutes or to a rodeo. They don't abuse the animals. Flank straps are like belts, twisting the tail, just makes them move, doesn't really hurt them, and the 'prod' is also used to get them to move. How else do you expect people to get them to move, lead them, walk behind them? No, that is when serious injuries can occur because they want to buck and do their thing. This is what they are bred for. The animals would be more upset if they didn't get to do this. Do you know where i can download that movie? i have been to rodeos all my life and they do NOT abuse the animals at all! I heard when I went to a Rodeo that they feed them Alfalfa, and expensive feed everyday! They do all this to compete 36 times for 8 seconds a year! Hannah, those animals are bred and born to buck, they are trained to have more style when bucking too. I bet you've never been to a rodeo either. 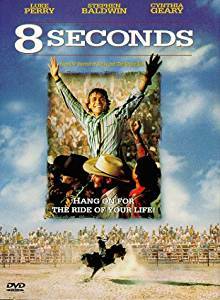 Love the movie, sad, but I don't see how 8 seconds is a horse movie, rodeo movie yeah, but not necessarily a horse movie. rodeos are cruel. some people never see what is going on behind the chutes but what they are doing is very cruel. Flank straps, prods and tail twisting makes the animals perform what they are not (wild, rank and mean). These animals are not born to buck, they are abused animals. It is a great movie with a really sad ending! That movie is amazing it also wants to make me cry! Return to Share Your Favorite Horse Movie Review!.